13 inches tall (33 cm). 13 inches long (33 cm). 4 inches deep. 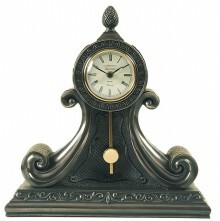 Stunning and Beautiful large bronze clock designed by Genesis. The brass pendulum swings. Hand Made in Ireland, and buffed for a brilliant shine.